Faith and Crafts Volume 1 "Techniques for repair and handiwork for preservation: the large-scale renovation of Kiyomizu-dera Temple"
Countless crafts come together to form a temple. 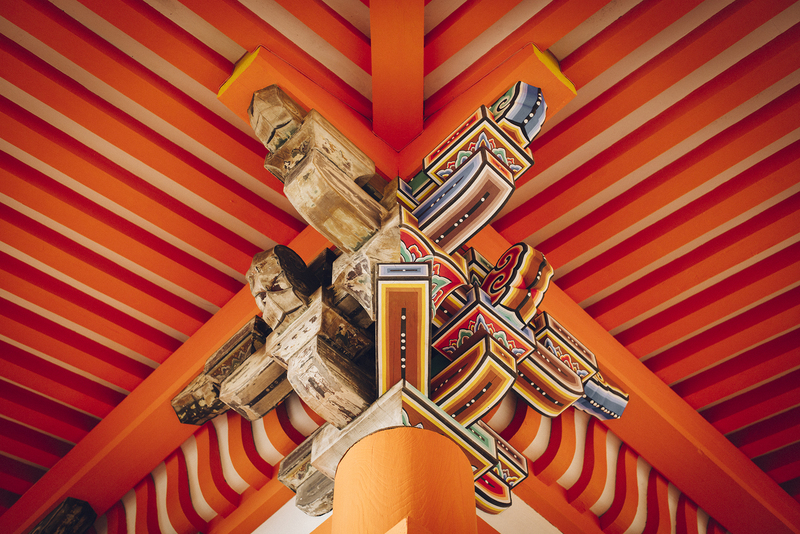 Like the solemn splendor of paradise, every shape and every color serve to express the world of Buddhism. It is the ultimate in handicraft, combining stately majesty that inspires devotion and robustness to last for generations to come. But no matter how much effort goes into its creation, no building lasts forever. As it decays it is repaired, and if it burns down it is rebuilt. The temples that still stand in Kyoto have been protected in this manner. 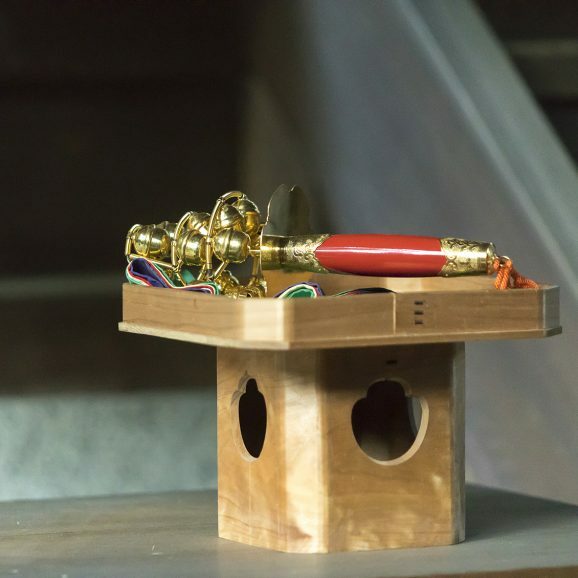 It is no wonder that Kyoto, home to the main temples of various sects, has remained Japan's largest producer of Buddhist fixtures and implements throughout its long history. 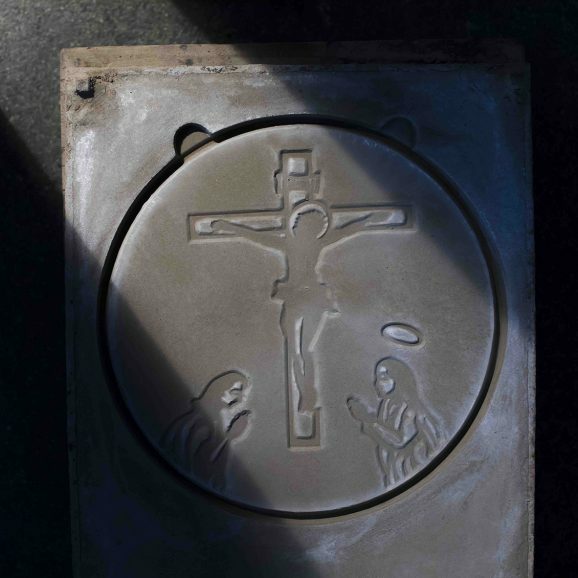 Even now, the handicrafts that have brought shape to prayer and been nurtured by faith are being quietly passed down to the next generation. At Kiyomizu-dera, nine temple buildings are currently undergoing preservation work. Begun in 2008, the work is planned to take about 12 years with a total construction cost of approximately ¥4 billion. The large-scale project is unprecedented even in the history of Kiyomizu-dera that spans more than 1,200 years. The repair of historical buildings is usually done one structure at a time, but in these “major Heisei era repairs,” two or three structures are being repaired at a time due to the steady year-round flow of visitors to Kiyomizu-dera. Repairing one national treasure and eight important cultural properties one after another makes this a rare undertaking. 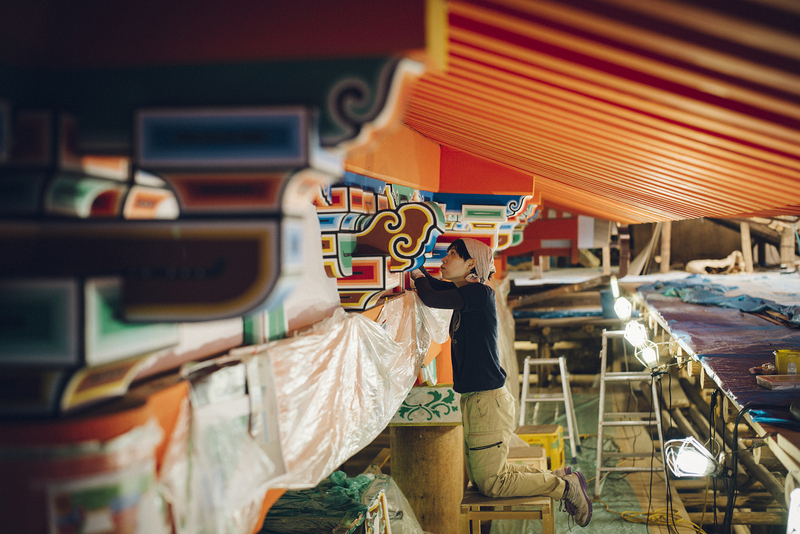 Traditional construction is made up of many types of handicrafts: scaffolding workers, plasterers, stonemasons, roofers, carpenters, lacquerware craftsmen, gilding craftsmen, painters, and more. The sight of so many different craftsmen converging on the buildings of Kiyomizu-dera may never be seen again. 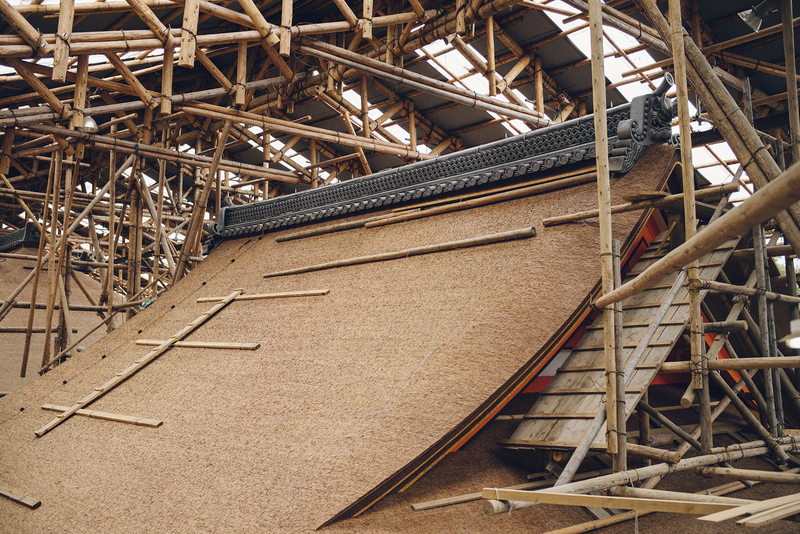 In the first repairs to the Main Hall in roughly half a century, the hiwada-buki (cypress bark shingling) roof is being replaced and various damaged areas are being repaired. The sight of the Main Hall covered by a temporary roof is a rare one seen only once every 50 years. When the preservation and repair of national treasures and important cultural properties is done with support from the national government, there is a requirement that the work be supervised by a chief conservation architect specializing in cultural property structures, certified by the Agency for Cultural Affairs. In Kyoto, Shiga, and Nara, where chief conservation architects are on staff with prefectural governments, the prefecture directly manages renovations. In other prefectures, a public interest incorporated foundation takes on that role in most cases. 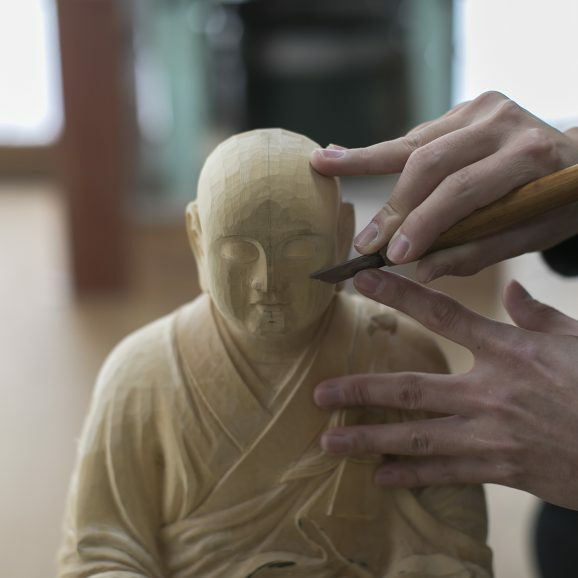 The Kyoto Prefectural Board of Education’s Cultural Properties Division handles the preservation and repair of national treasures and important cultural properties in the prefecture. The largest advantage of the prefecture’s continued management of repairs is the aggregation of records. The previous repairs to the Kiyomizu-dera Main Hall were done in 1967, and the detailed records of the materials and techniques used enabled precise repairs half a century later. 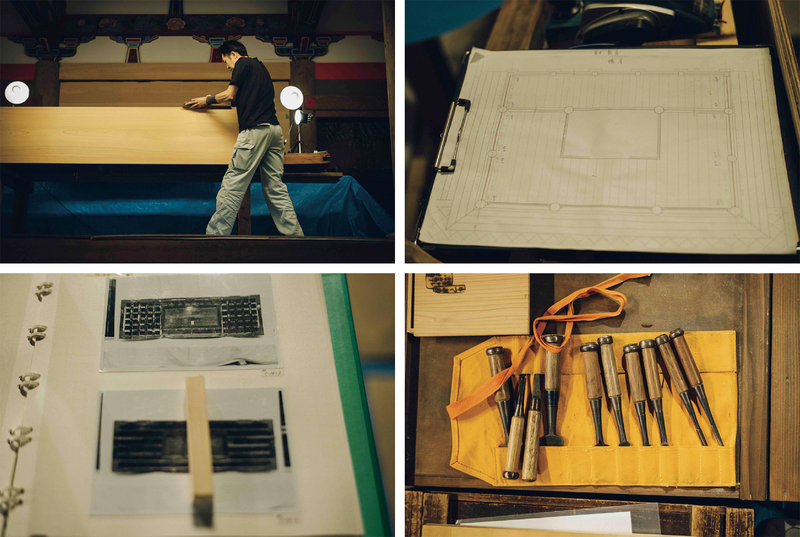 Along with records, the craftsmen’s traditional methods are also passed down to the present day. The round logs used in the scaffolding for Kiyomizu-dera’s repairs do not damage the original material and can be set up and disassembled smoothly. This technique that has been passed down for several hundred years on wood construction sites is yet another tradition being conveyed to future generations. “Round log scaffolding, easy to set up and take apart, is the wisdom of those who came before us. Standard metal scaffolding is more efficient, but craftsmen’s techniques like this are intangible culture too,” says the Kyoto Prefectural Board of Education Cultural Properties Division’s Yutaka Shimada, supervisor of the Kiyomizu-dera repairs. 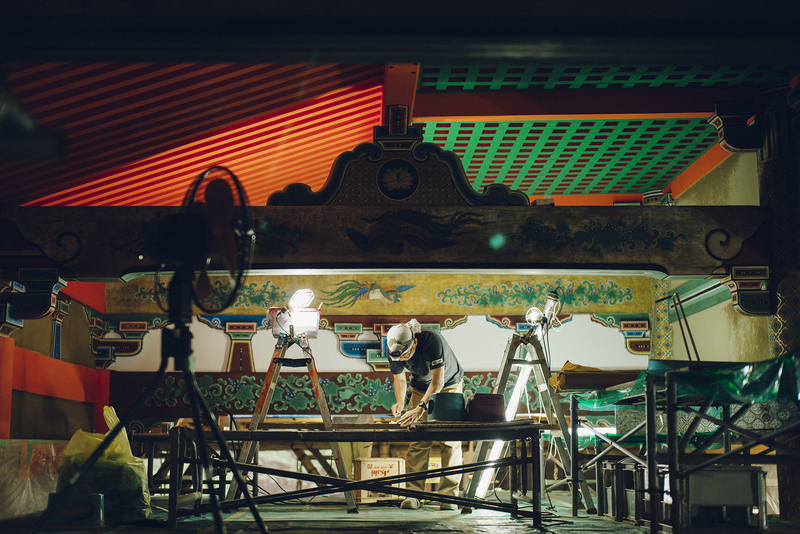 As a combination of historical verification and succession of craftsmen’s traditions, the conservation of historical structures is a hybrid effort of academics and handicrafts. Complete restoration or preservation of the current state? The choice is an unavoidable one in the conservation of historical structures. If restoring, which time period’s appearance should the structure be restored to? Before work begins, an enormous amount of time is devoted to the examination of historical materials and debate. The Main Hall was last repaired roughly half a century ago. The primary work to replace the hiwada-buki roof did not begin until 2017, but purchases of the cypress bark for the roof began in 2009. When repairing cultural properties, re-using the original material as much as possible is a fundamental principle. The robust natural materials bring the techniques of past craftsmen into the present. When renovating the Main Hall, only the damaged portions of the columns supporting the stage were cut out and replaced with new wood in a technique known as grafting. First-aid fixes like this based on a preservation repair approach have been repeated over and over to create the current temple. But this method is not enough to last hundreds of years. To prepare for future repairs, Kiyomizu-dera is planting trees in mountain forests in Ukyo ward in the city of Kyoto, Maizuru in Kyoto Prefecture, and more. Of the 6,000 saplings planted so far, Shimada says only about 10% will grow to be usable as columns in 400 years, but steps still need to be taken now. The major Heisei era repairs now underway are slated to be completed in 2021. Supported by the skills of many craftsmen, the major undertaking now enters its most important stage. Since the Law for the Preservation of Old Shrines and Temples was enacted in 1897, the division has conducted the design, supervision, etc. of the preservation and repairs of national treasures, important cultural properties, and other cultural property structures in the prefecture. They work with craftsmen from a wide range of fields.